We all know how much Sarah Palin loves to talk about conservative heroes such as Ronald Reagan or Margaret Thatcher - especially strong females - so it came as a surprise (not really) when Sarah Palin wanted to make a photo-op trip to England (perhaps to warn the British) and meet with former prime minister Thatcher, but The Guardian reported that Thatcher wanted nothing to do with Palin. The Guardian cited a Thatcher "ally" as saying "Lady Thatcher will not be seeing Sarah Palin. That would be belittling for Margaret. Sarah Palin is nuts." "I have no inside knowledge of this business to offer I am afraid and certainly am not in a position to make any kind of statement on Lady Thatcher’s behalf." So what does this mean for Hoft, Big Journalism, and all the Sarah Palin supporters out there? "We were right," wrote Hoft. "The Guardian‘s article was likely just another lame Palin smear by the left." Wow. Hoft is one big idiot! I wonder if Hoft even knows what The Margaret Thatcher Foundation is all about? One of The Foundation's five goals is to "foster greater contact between Western nations and those of the Middle East in the region's search for a lasting peace with security." Hoft is a known Islamaphobe, as well is Palin, who defended Franklin Graham (son of Billy Graham) for saying "a very evil and wicked religion." "Are we really so hyper-politically correct that we can’t abide a Christian minister who expresses his views on matters of faith?" asked Palin in one of her Facebook notes. Remember during the 2008 campaign when then Senator Obama called for open dialogue with nations like Iran. "I do not believe we are going to be able to stabilize the situation without them... we should be talking to them as well," said Obama. That sounds to be in line with The Margaret Thatcher Foundation's goal of "fostering greater contact" with the Middle East. During that campaign, Palin's running mate John McCain called that position "dangerous" and Palin stated in an interview with Katie Couric that "Barack Obama is so off base in his proclamation that he would meet with some of these leaders around our world who would seek to destroy America and that, and without preconditions being met," calling it "naive" and "beyond bad judgment." And let's not get into the hypocrisy about Palin's adoration of people like Ronald Reagan when Reagan and his administration sold arms to Iran to help fund the Nicaraguan Contras. So it is not okay to talk to Iran but it is okay to sell them weapons? While Hoft thinks his reader's letter is proof that Thatcher really wants to be BFFs with Palin, in reality, it would appear that maybe The Guardian's article was closer to the pin. 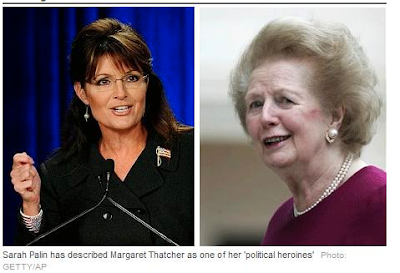 Why would Margaret Thatcher want to meet with Palin anyway? Oh, because Sarah is the next best thing since sliced bread, and because she has such adorable children, and because she is SO knowledgeable about US History that I'm sure she could spare a moment on the plane to google British history for 10 seconds before landing. Yeah, Hoft, the British just love moronic Americans who think that God talks to them regularly, while promoting all kinds of values that are closer to the devil than God. But, sure, it's another plot against Sarah...I think she's off her meds again. Hoft is too stupid to realize that in saying they cannot make any statement on behalf of Lady Thatcher, they are saying they cannot confirm or deny what was said. Of course, he wants to believe nobody would ever say anything like that about Sarah, despite it being 100% true.